I finished knitting my first pair toe up socks while watching the Oscars last night. One of the reasons I wanted to try toe up knitting was because I could use up every last bit of yarn, it seams like whenever I knit myself a pair of socks I have tons of yarn left over... well, there is a very good reason for this, I have teeny tiny little feet. I wear a size 5 shoe, and though I don't think of my feet as unusually small, people do often comment on the cuteness of my little shoes! Anyways, using up every last yard of yarn resulted in knee high's! I'm still glad that I learnt a new skill, but I don't think I'm going to be applying my every last yard approach to all of my socks from now on. I didn't add in any extra shaping for the knee high's. 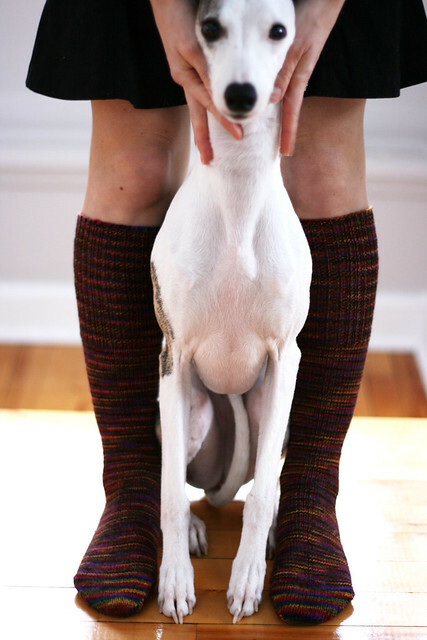 These socks were knit on 2.5mm needles in Prism's Merino Mia yarn in the very lovely Harvest colourway. The yarn comes in 50g skeins and I used exactly one whole skein per sock. 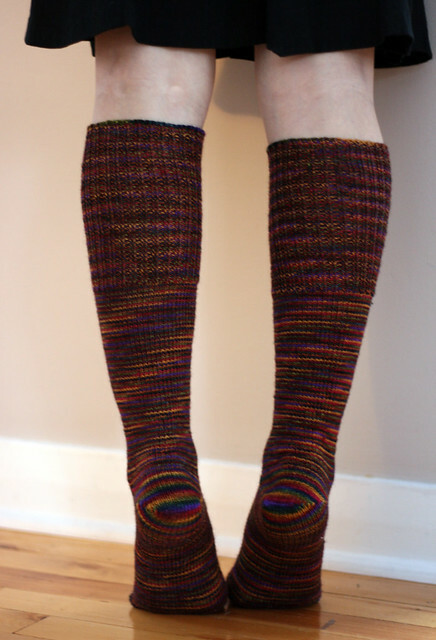 I did lots of 1x1 ribbing and the socks fit very comfortably around my calfs. I did a short row toe and heel using Wendy's pattern as my guide, and used Jeny's surprisingly stretchy bind off, which is, needless to say, surprisingly stretchy. And when I don't feel like wearing them pulled all the way up to my knee's I'll just turn them dow, it's like a sock and an ankle warmer all in one!